Helping People.. it’s what they do. They help clients, community, and other attorneys. Yes. Other attorneys. Several lawyers at the William Mattar law offices can be found at New York State Bar Association CLE (Continuing Legal Education) programs presenting segments on various areas of law. Recently, attorney John Abeel was part of the Intro to Civil Practice Skills: Torts, Personal Injury and Insurance Law CLE in Buffalo, NY. His segment was The Lawsuit: Venue, Pleadings & Discovery. Abeel’s experience as a trial attorney is evident as he helps clients through their auto injury accident cases. Sharing his time and talent with other legal professionals is just one example of how the William Mattar team is there to help others. And speaking of sharing time and talent, William Mattar Attorney Manager, Dave Rusin, is a frequent presenter at the NYSBA CLE’s in Buffalo. 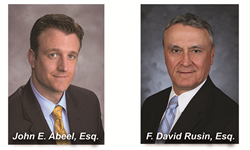 Rusin’s presentation for Friday, July 13th is titled Automobile Litigation: Handling Auto Accident Case Key Considerations in Advising Clients in NYS. His presentation at Hyatt Place Amherst is just one in a long line of involvement with this type of continuing educations for legal professionals in Western New York. Whether you attend a presentation where a William Mattar car accident attorney is a speaker or find yourself volunteering at a community organization next to one of our staff, helping people beyond the law firm and courtroom is always going to be important to William Mattar law offices.